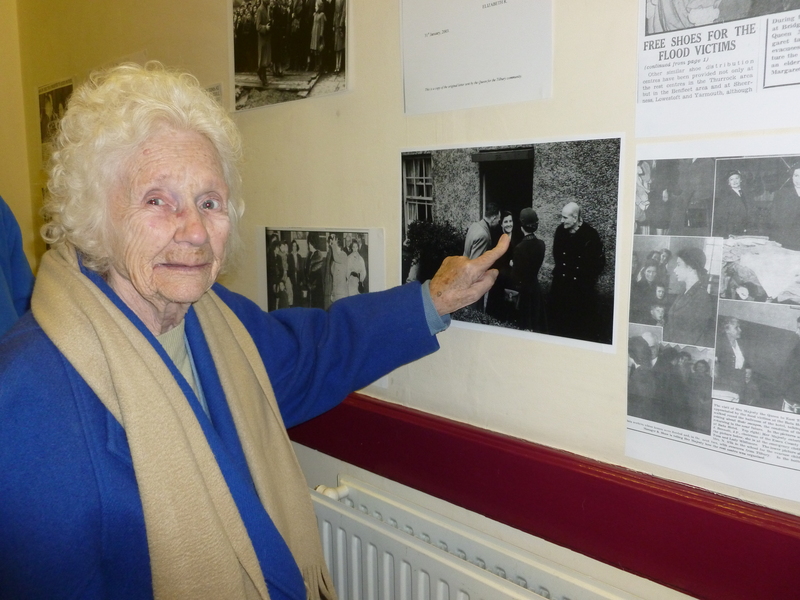 You are here: HomenextPeoplenextBringing back memories for Annie Courtney aged 94!! Annie Courtney aged 94 was the oldest visitor to come to remember the 60th Anniversary of the Tilbury Floods. She was delighted when she saw the photo of her god-mother Nora Benton meeting the Queen in Tilbury after the floods. Annie told me that her god-mother was so excited about the Queen coming to see her that she got all the china out and offered her a nice cup of tea!! The Queen had many to visit that day so didn’t accept a cuppa but Annie still remembers it to this day. I took this photo of Annie pointing at her god-mother and it was so lovely to see how happy she was! She said to me as she left that she had a great time and would be back to celebrate the 70 years of the Tilbury floods! What a great sense of humour, I really hope you do come back Annie! !